Welcome to another week of Weaning Wisdom Wednesdays. Each week I am joined by another blogger who imparts their weaning wisdom. 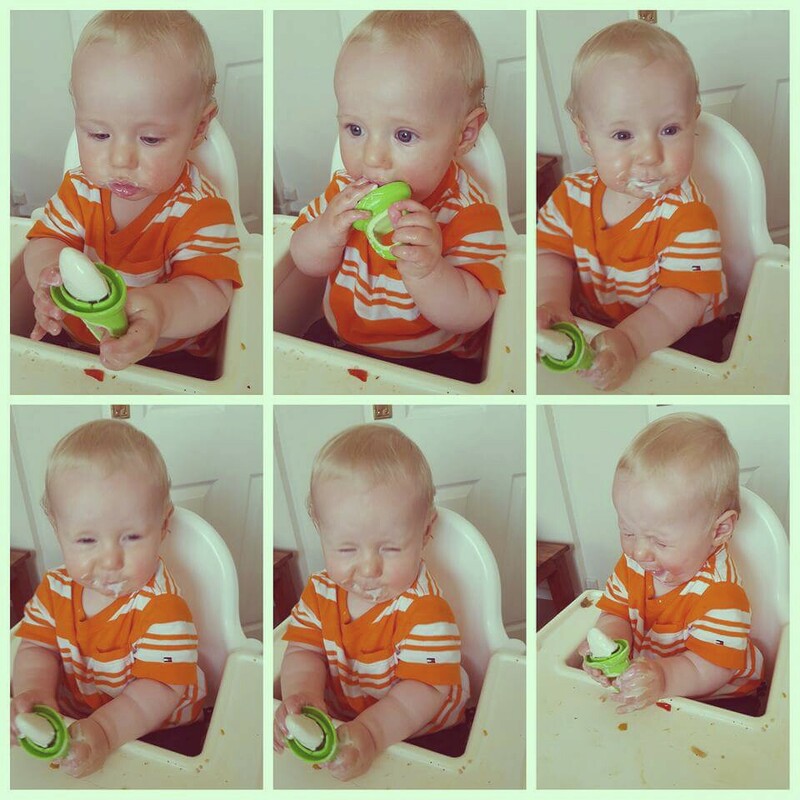 There are so many different methods of weaning out there and it’s so nice to read all the different ways each week. This week I am joined by Abi from Something About Baby. I think this is possibly my favourite submission yet! Take it away Abi…. 1. Introduce yourself and family. Hi, I’m Abi, a 28 year old mummy, wife and blogger from Essex. By day I work full time in London as a PA and by night I blog over at Something About Baby. In between that, I am wife to Craig and most importantly Mummy to our crazy, beautiful, cheeky chappy Alfie who is 22 months old. Since becoming a mum I’m learning to juggle no sleep, sharing my food and having to constantly entertain a boy who’s energy knows no bounds, but I’m loving every minute of it! We decided from quite early on that we would go down the baby-led weaning route. 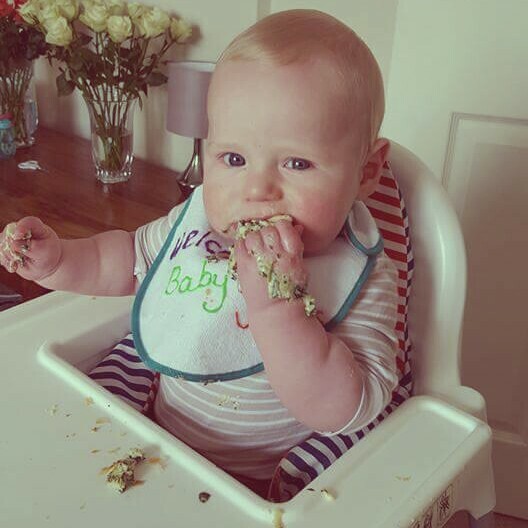 It was a method that a lot of friends on my facebook baby group recommended and the ease of it really appealed to me – I’m definitely far too lazy to be chopping, cooking and blending food every day for the baby! 3. When did you start weaning and why? We started weaning at 6 months. Apart from this being the recommended guidelines set by the NHS, I had done a lot of research into early weaning and why it can be harmful if done before 6 months (unless of course for medical reasons). 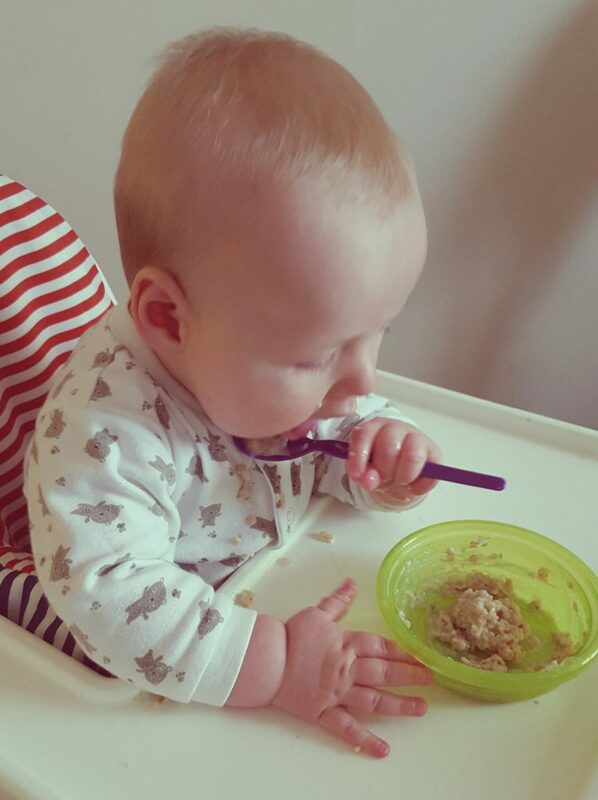 However, I completely understand that some babies are ready before 6 months, but I was very conscious that with baby-led weaning your baby has to be fully able to sit up and hold their head properly in order to be able to swallow food. I was also exclusively breastfeeding and loved the ease of being able to feed without much thought, so waiting as long as possible definitely appealed to me, and Alfie was completely satisfied with just breastmilk up to this point. 4. Talk us through your journey, how did you start, what did you do? I am very much the type of person who does their research, so I looked at a lot of websites and facebook groups about baby-led weaning to get as much information as possible about what to do and how to approach this method. Although my online baby group friends raved about it, I didn’t know anyone who did it in “real life” and my family seemed very concerned about the whole concept, so I had a lot to learn! I also went on a baby first aid course which taught my husband and I what to do in a choking situation. I found this invaluable and it made me much more confident to use this method. 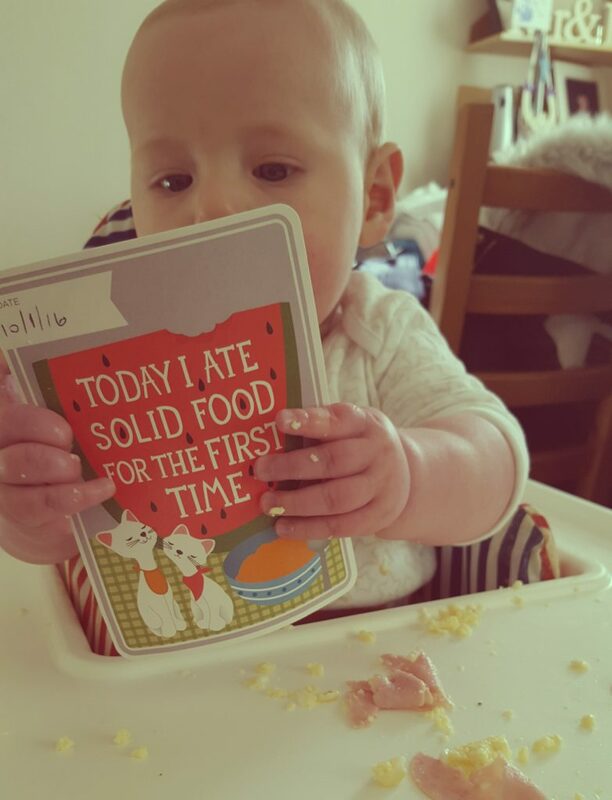 I bought the Baby-Led Weaning Cooking by Gill Rapley which was fab, and then I started by simply sharing our meals with Alfie. It was that simple – I didn’t have to make different meals, I just gave him what we ate as well as baby friendly snacks. I started by giving him breakfast and his first food was scrambled egg and ham. Then after a few weeks I introduced lunch, then snacks, then dinner. By 8 months he was eating 3 meals a day as well as snacks. His snacks included cucumber sticks which he loved, and frozen yoghurt lollies which were great in the summer. We are also huge fans of Organix snacks for when we’re out and about. 5. What was their favourite food? Alfie took to food like a champ – he was always a good feeder and loved his milk so I didn’t doubt he’d be any different with real food. His favourite foods when we first started were pasta, especially spaghetti bolognaise, or sausage lentil casserole. He was also partial (and still is!) to a bit of curry! He loved strawberries and blackberries too. 6. What sort of food did baby eat when you were out and about? When we first started weaning, I would usually take food with me to save buying a huge children’s meal that he wouldn’t eat, or having to share mine and watching half of it go on the floor!! I always took cucumber and pepper sticks, as well as Organix crisps and fruit bars as they were easy to chuck in the changing bag. Then I’d make things like spinach and ricotta pancakes or carrot and cheese muffins from the Baby-Led Weaning cook book. When I was on maternity leave I would batch cook them, which meant just taking them out of the freezer in the morning so they’d be ready to eat by lunchtime. However, if I was ever caught short without any food, doing baby-led weaning meant that it was pretty easy to pick something up in the restaurant, or in a shop that Alfie would eat. He definitely wasn’t (and isn’t!) a fussy eater! 7. What highchair did you use? Would you recommend it to other Mums? We had the Ikea Antilop highchair as it was recommended to us and I now recommend it to everyone! So easy to use, easy to clean and most of all cheap! When it’s permanently covered in mess, I’m glad I didn’t spend a fortune on one. 8. What is your opinion on offering baby fast food? I have to say I was pretty strict in the first year of Alfie’s life. Whilst he was learning to eat, and learning new flavours I was very strict about giving him treats and always making sure he ate healthy food. Now I’m more open to treats such as cake and chocolate, however he’s never had what I would call fast food (eg McDonald’s or KFC) as we don’t eat it ourselves (and if we did, I’d always favour buying him a sandwich from a shop instead). He has had the occasional pizza and chips though and I wouldn’t say no if there was no other choice, but it definitely won’t be a regular thing for us. 9. What was the most challenging aspect of your weaning journey? 10. Have you ever received any criticism for your weaning choices? Not to my face, but I’m sure people have discussed it and criticised me behind my back. I know my dad for one couldn’t get his head around us letting Alfie eat with his hands, and generally cause so much mess in the early days before he learnt to use cutlery. I really didn’t care what people thought though, it worked for us, it was easy and I’d do it again with future children. 11. Did you meal plan, or just offer whatever is available in the fridge? We always meal planned – but then we always have done, so because Alfie just ate what we ate, there was no need to change the way we decided our meals. 12. What tools did you buy that were invaluable? Apart from the high chair, a plastic mess mat from the pound shop for under the high chair was a lifesaver, especially as we have carpet in our lounge diner, so it saved the stains!! I’d also highly recommend the Baby-Led Weaning cookbook. One of the good things about baby led weaning though is don’t need a lot of “stuff” to give it a go! 13. If you were to do it all again, what would you do differently? I honestly wouldn’t do anything differently, I feel this method really worked for us, and for Alfie, and I’ll be doing exactly the same with future children. 14. If you could give one piece of advice to new Mums who are about to start weaning, what would it be? Do what works for you. It’s your child you are weaning, and you know what works for you as a family, be it traditional weaning, baby-led weaning or a mixture of both. Do your research but also trust your instincts. Mostly, just enjoy it! It really is wonderful to see your little person discovering a new skill and developing that skill as they get older. Thank you so much to Abi for joining us! Check out previous installments of Weaning Wisdom Wednesdays here.